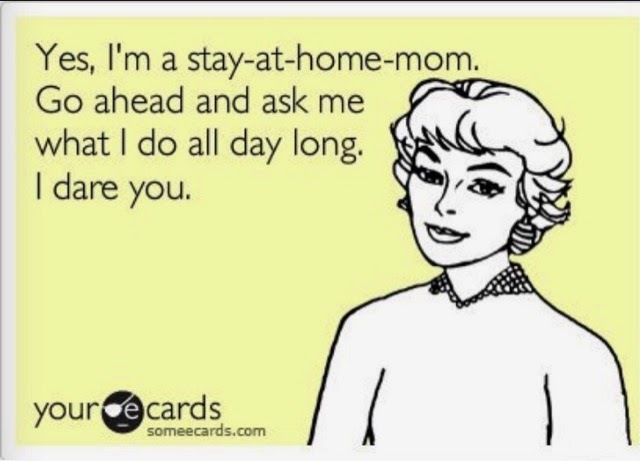 Why is it that Stay at Home Moms are frowned upon? We are talked to and about as if we are nothing. People assume that we do nothing all day and that's far from the truth. It's in fact the exact opposite. The way I see it is that Everybody does what's best for them and their family and I get that. I know there are many moms who would rather be home with their children but have to work. I admire and respect the working mom so much. I couldn't do all that you do all day and come home and never sit down. Being a mom is a 24/7 job whether you work or stay home. I did What was best for my family and that was for me to stay home with our son. There were so many reasons why I chose to stay home with our son and I will never regret that. I have enjoyed every minute of it. We have made so many memories and have had such a wonderful time. Anyway I put together a list of things you should never say to a Stay at Home Mom. 1) Do you ever get bored? umm No- With a toddler that is constantly on the go 24/7 there is no time for boredom. 2) What do you do all day? -There is not enough room to name what all that I actually do. Chef, nurse, teacher, maid and taxi are just a few. 3) You should go back to work so you will have something to do! -Excuse me! I have plenty enough to do. Actually there aren't enough hours in the day to get done what is needed to get done. 4) Why didn't you get this or that done? -Well let's see. Sometimes when you have a screaming baby all day or a sick baby it's hard to get to take a shower let alone anything else. 5) It must be nice to get to stay home all the time! - It is nice but it is most certainly not easy. 6) Do you ever wish you had your own money? - This has never been an issue with my husband and I. We have always thought of the money as ours. 7) You are so lucky that your husband let you stay home. - Excuse me! My husband didn't let me stay home. We both agreed that it was best if I stayed home with our son. 8) Since you stay home all the time, your house should be spotless. - It is impossible to keep a clean house with a toddler who loves to dump all of their toys out in the floor a million times a day. People can really be so cruel. Don't belittle someone just because they make different choices than you do. It's not our place to judge others. We should lift each other up and encourage one another instead of trying to tear someone down. Stay at home moms should be respected more. It's a never ending job. We barely get credit for anything that we do. I have had some negative people in my life lately that have judged me and looked down on me for being a stay at home mom so I had to vent a little.